I am so excited to finally share the full reveal of my master bathroom makeover and give you all of the details! This post is sponsored by Delta Faucet. All thoughts and photography are my own and are not influenced by Delta Faucet. Tile has been provided by The Home Depot with details and a full post coming soon! Thanks for supporting the brands that support this blog. While our master bathroom location is the same, we replaced most of the elements that were dated and worn. I have to say that I’m completely over the moon with how it turned out and it has the elegant yet zen look that I envisioned. This has been our forever home and we raised our family here. Elevating this room to a new level will serve us well and if we sell in the future it will give the house more value. Before I get into all the love of new in the master bathroom makeover, let me show you the before. Bathroom remodeling can be expensive, the only more costly renovation being the kitchen. We did cut a few corners to save money on the master bathroom makeover and kept the original vanity cabinets. They have solid wood doors and were still in good shape. We repainted them and changed the hardware, which made an enormous difference. The round sinks were also in good shape and I’m aware that square or rectangular sinks are trending. I am more traditional and kept what we had because I like them. The former granite countertops were no longer my taste and were replaced (Hanstone Quartz Montauk) when we updated the kitchen. Inspiration comes in many forms, but I was definitely inspired by several upscale hotels that I’ve stayed in over the years. I was envisioning a high end hotel look for less! When you plan a room renovation from start to finish it takes time and we started the planning about 8 months prior to completion. After many discussions of finishes and the look, our first task at hand was to create a vision board. This was my job, and I scoured Pinterest and Instagram for ideas. My husband is a general contractor with a company that actually specializes in high end home remodeling. He did all of the measuring and lining up assistance. There were definitely a few differences of opinion along the way to plow through with designer vs contractor! The shower that stood before was torn out for several reasons. We knew that we had room to expand it slightly and put in a large shower bench. One of my top priorities was to have a frameless shower enclosure, so that I didn’t freeze whenever the air conditioner turned on. I requested a much larger shower niche with two shelves to accommodate tall bottles of shampoo. 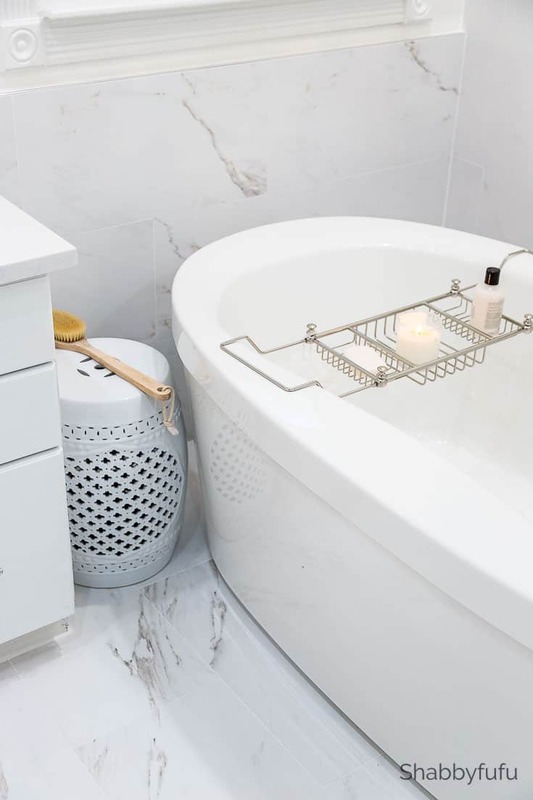 The existing well-worn tub was removed and replaced with this roomy and beautiful freestanding tub. It’s absolutely gorgeous and I can really stretch out and relax with a good soak! The toilet needed to be removed since we were taking out the old tile flooring, so we opted for an elongated dual flush toilet. That part went quickly and took the tile contractors a couple of days. I shut off the a/c in that part of the house and made sure that they put up plastic sheeting first since it does make a dusty mess. Rather than bore you with installation details, I’m providing visuals of the finished work. Hiring two trades to assist with this project was a solid decision, as the scope was too involved to do it ourselves. We hired two local companies that work with our family construction business on a daily basis, Coral Gables Plumbing and Twins Tile. The work that we did ourselves was drywall patching and repair, painting the ceiling, walls and cabinetry. My husband (who is well qualified) did all of the electrical work on the master bathroom makeover (while I watched:-)). There is an incredible difference now when you first view or walk into the room. It has that modern and clean look that I was going for and plenty of light. 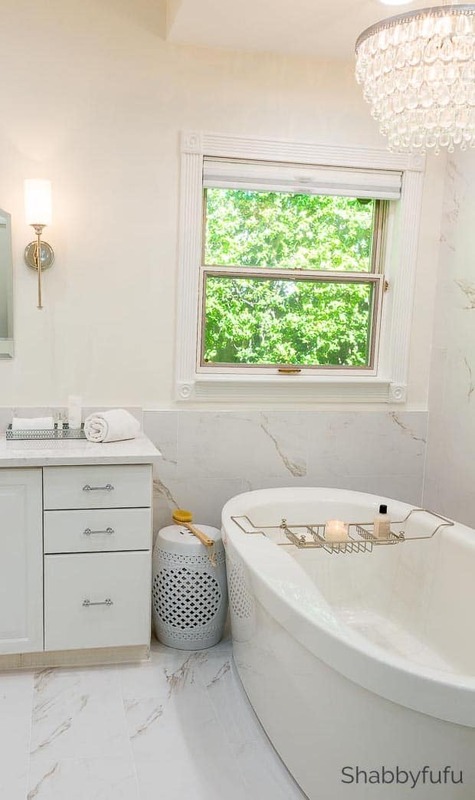 We could have extended the glass enclosure all the way down the wall to the end of the tub area, but it would have been awkward with the window placement. 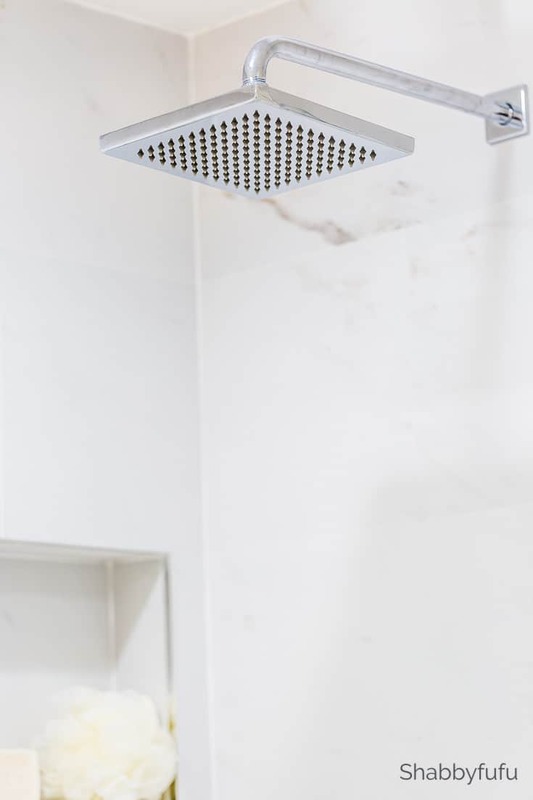 The rainhead shower is large and soothing to the soul. We opted for this Metal Raincan Shower Head Assembly. 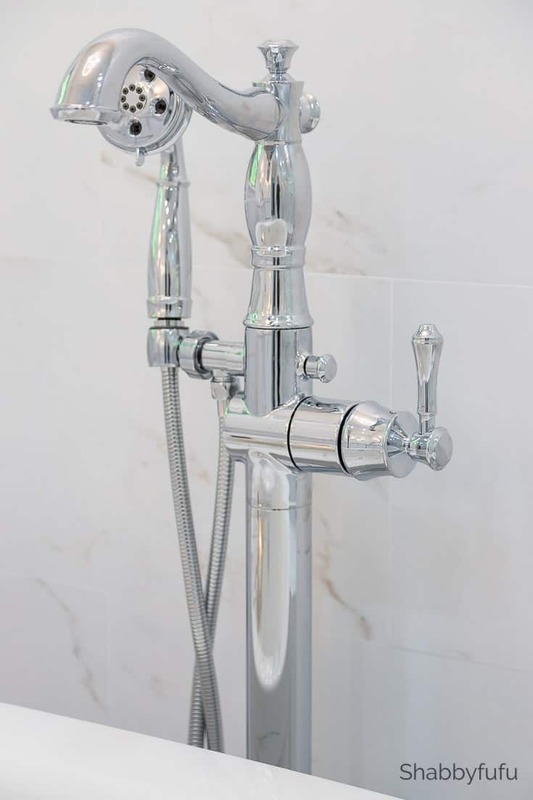 The Delta Temp2O® 6-Setting Slide Bar Hand Shower is my husband’s (the gadget lover) favorite. He loves how the display shows you the temperature of the water and also that it’s backed by Delta Faucet’s lifetime warranty. Our plumber was really impressed with the Delta Faucet items too. 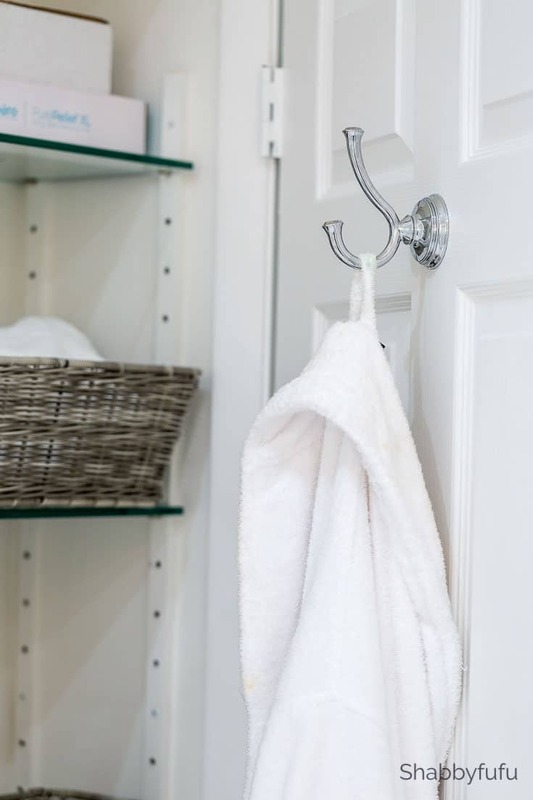 I wasn’t sure if I wanted another towel bar or hooks, but when I saw the Cassidy 30″ Towel Bar I loved the shape. It’s curved out, making the towel easy to grab or place back after showering. Here is my hook! 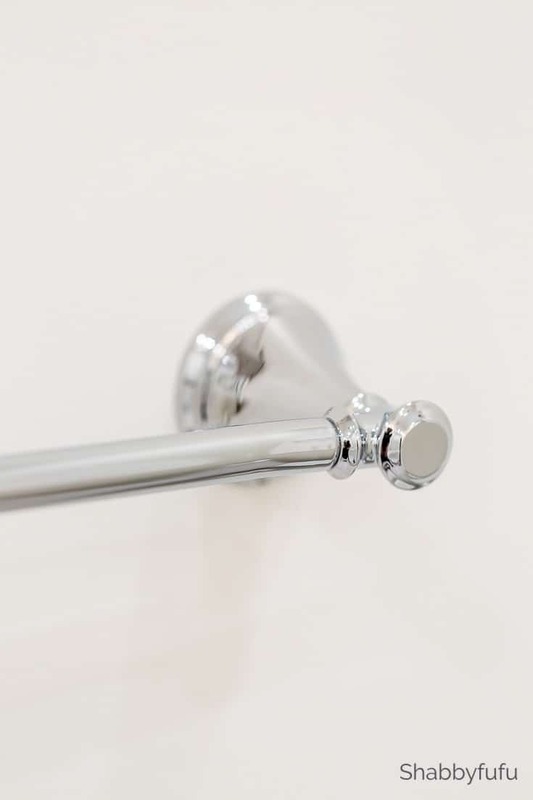 We installed the Cassidy Double Robe Hook on the back of the bathroom door. 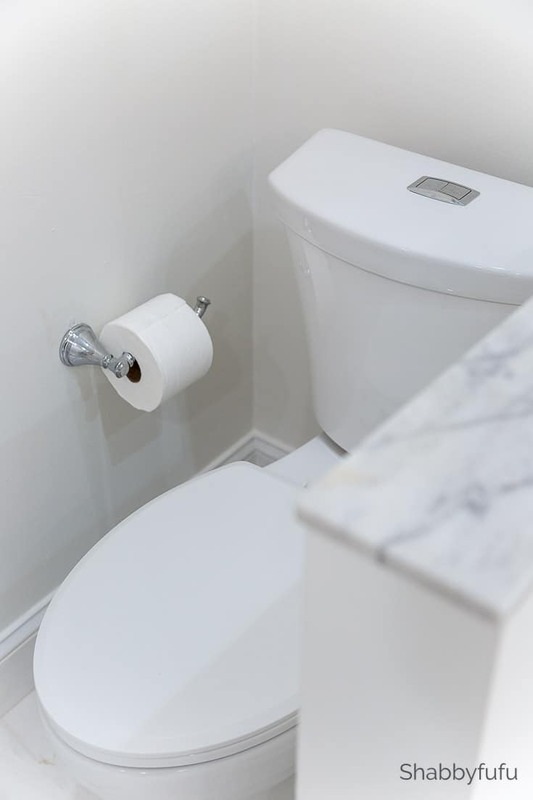 I don’t know if it’s possible to love a toilet, but the elongated shape and the dual flush are wonderful. It took a bit of getting used to, not having a handle, but it’s sleek and functional for our space. 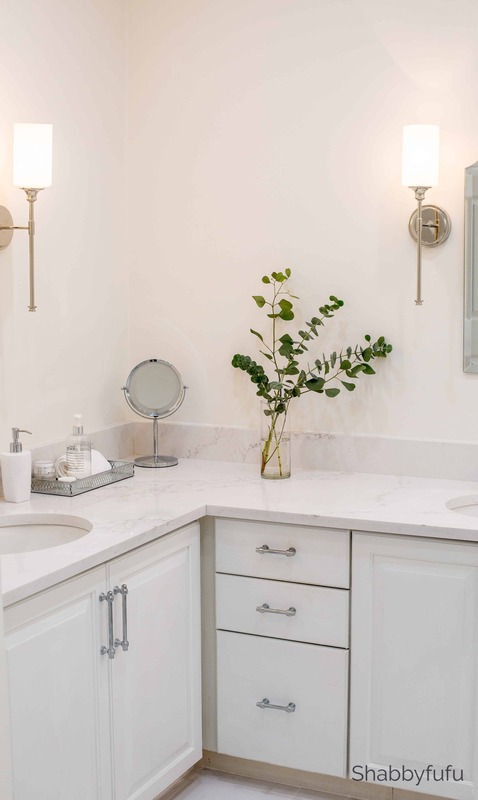 The Cassidy Tissue Holder coordinates with all of the polished chrome fixtures in the room. This Delta Freestanding Tub is really the star of the room, and the chandelier enhances that luxe feel. Honestly I feel like a queen in this bathroom now! A soak in here after a long day of running errands or working is just amazing! And finally, the Traditional Tub Filler is perfect for my modern bathroom renovation. It’s modern and yet traditional and we have a few more touches to add here which I’ll be sharing soon! 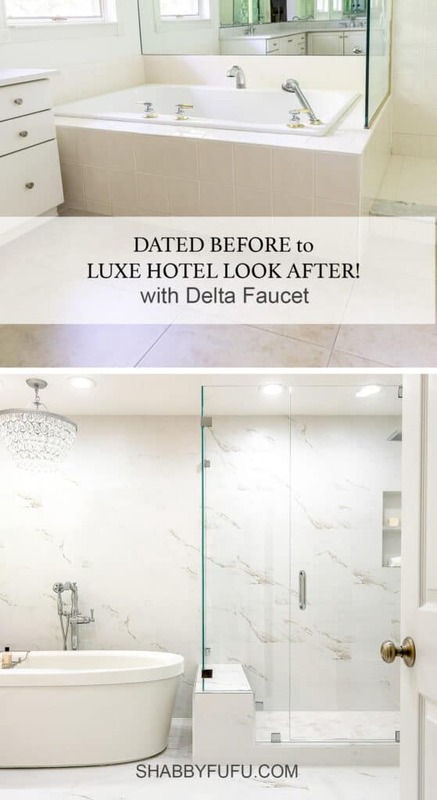 If you have any questions, please ask…but we are super satisfied with everything from my sponsor Delta Faucet and I hope that you love the look as much as I do! Janet, that is absolutely gorgeous! I have an even more dated master bath (picture carpeting and teal faux granite (???) counters). I’ve been waiting to see how yours came out so I can show it to hubby to prove to him that yes, our bathroom does need updated 🙂 Love, love, love that Delta shower system. It all looks very luxurious and spa like! Carpeting I could not take Pam, lol. Delta makes some really quality and amazing products and we use them in our family construction business as well! We redid our two bathrooms last summer and are very happy with the results. We also used Delta faucets and fixtures and was very happy with how everything looks and works. Love the makeover- absolutely beautiful! Janet such a transformation and so good to know you didn’t just throw everything out. Love the fact that you always manage to hold onto what’s still good. That is such a lovely space! I love everything you did here. The faucets are wonderful. I’m a little biased, though. All of my faucets are Delta. Thanks so much Stacie! Delta does make quality products and I was happy to work with them on this project. It is just stunning! I love how elegant it is but also so clean and crisp! That chandelier is divine!!! So happy for you and thank you for sharing! Can’t wait for the sources. Thank you Babette…it did take a long time, but worth it! I’ll be sharing some more detailed posts soon. I love everything about your bathroom makeover. It looks so light and clean. I especially love that you kept the beautiful vanity. 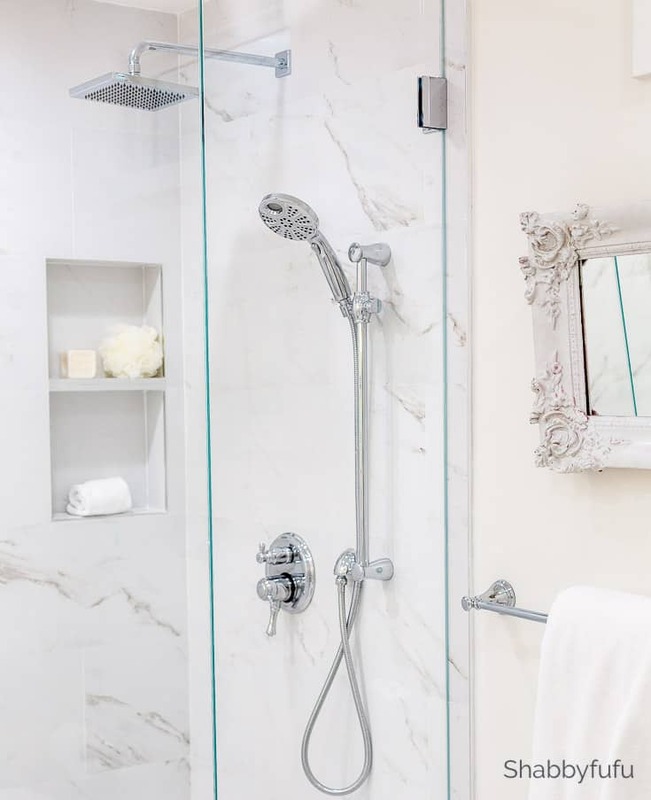 The faucets are all beautiful as well and I love how you created a spa-like bathroom retreat. Gorgeous! Thanks so much Alli…we are really pleased with the look and functionality now! Janet, I know you are so glad the mess is over and you have a beautiful space to enjoy now. It looks great! Hi Kim…thanks so much my friend and I am soooo happy to have this room done! Next comes the laundry room because I’ve become best friends with the Maytag repairman lately and refuse to spend another dime. I just love how your bathroom came out. Everything is so crisp and clean. I hope to do something like this with our bathroom one day. Thank you Amber and I hope that you get to redo your bathroom some day. Wow what an update! The after even looks bigger, more airy. I have not purchased a toilet in 20 years so I will have to look up dual flush, I’m intrigued! Thanks my friend and yes…toilets have come a long way!! Thanks so much Cindy! Next comes the laundry room here, since they appliances are really living on borrowed time and always breaking. Janet-what a beautiful transformation! 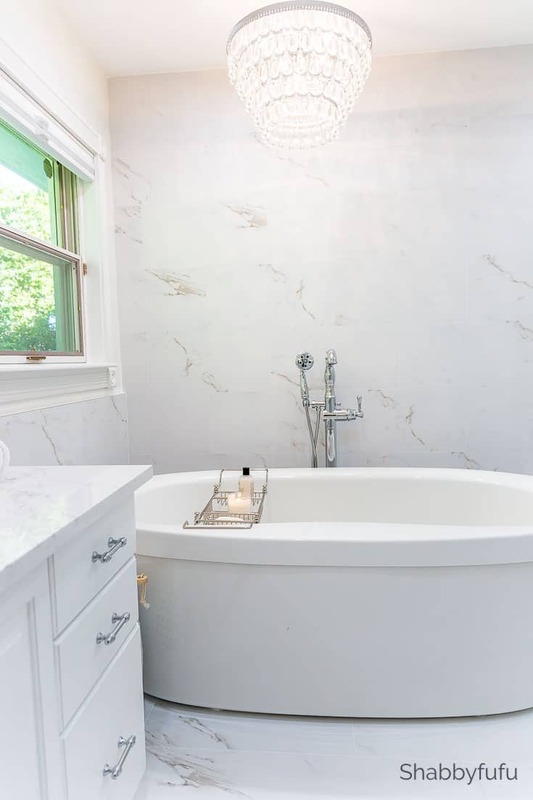 Can you tell me what you used on the floor and tub/shower surround? Thank you. I’ll be sharing that in another post soon Lana and talking about the details! Bwahhhaaaha, you have no idea how happy I was to get that huge tub out of my bedroom! I am really pleased and next comes the laundry room. Your new bathroom is gorgeous! I think the type of fixtures one chooses really sets off the look of a bath or kitchen. This is awesome! . So true Gisele…we based the design of the entire room on the Delta Faucet fixtures! Can you come and redo my bathroom funny LOL. That looks grudges and I would love to have that in my bathroom. Haha…sure! We are really pleased with the bathroom. Absolutely beautiful! We are currently getting things together to redo our bath as it is long overdue. (same one as when we built the home 38 yrs ago) Thank you for your inspiration I love it all. Loving that chandelier too! Very, very nice! I’ve only remodeled a bathroom once in my life and that was uber expensive. 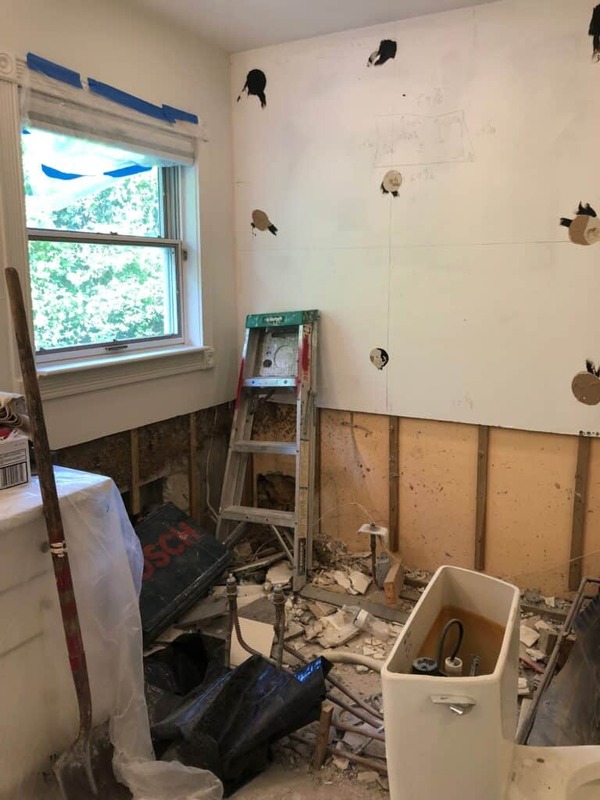 The house we just bought, though, has a horrible (I mean really horrible) master bath, so as soon as we can gather enough strength and money, we will be redoing it. I love your showerhead – I’m sure we’ll do something similar. We actually kept the cabinets and repainted them as I mentioned, so that is a big money saver. Good luck with your future remodeling project! Love, love that shower! I actually have the same faucet in my bathroom. That bathtub is calling my name. Your remodel was done with perfection. Thank you so much Tamara…we are really enjoying this renovation now that it’s finished! Absolutely stunning and fresh! I’ve been following your makeover on Instagram and been completely inspired. Thanks for sharing the beautiful transformation. Thank you my friend….we really are pleased and it was worth the wait! I love all of the finishes you chose for your new bathroom, including the faucets! I love a bright clean look and you definitely achieved it! I’m in all with this bathroom transformation. Loving everything about it. The Mister would love the Delta shower system. I’m in all over your tub. Yes, please! Oh my goodness what a bathroom make over! It looks absolutely stunning! Definitely a bathroom of my dreams I think. Thanks Sarah…it was sorely needed and we love it! Having the right faucets is so important for a bathroom. I redid our bathroom sink faucets and they look SO much better and less dated. They really do make a difference! 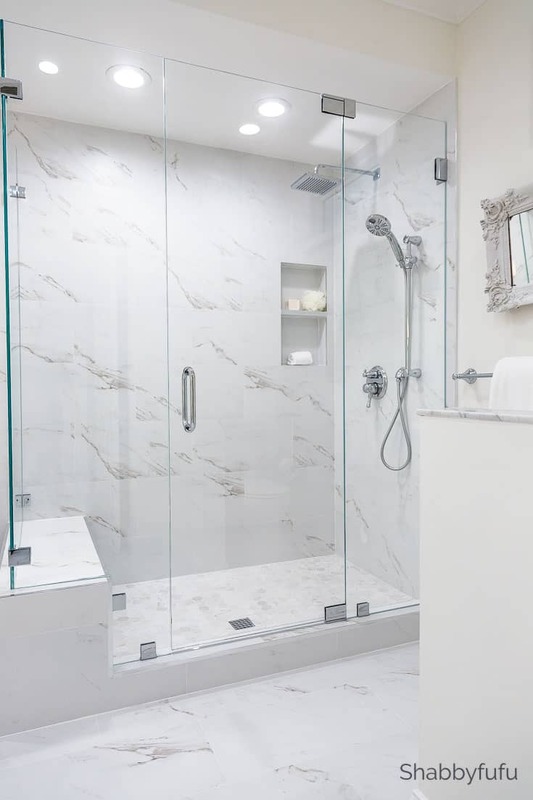 Your bathroom makeover looks so elegant! Very nice! I can imagine taking a little extra time to get ready in the morning might happen just to enjoy it. I love how it turned out. 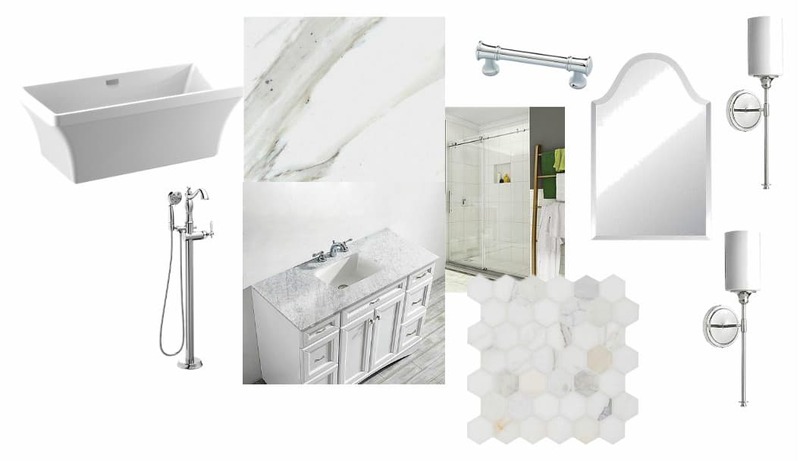 I can’t wait until we move into our new home and I can create the bathroom of my dreams. Thanks Heather and hope you get that dreamy bathroom! What a beautiful bathroom you have now! Elegant and with a lot of light. I also love all the details that are perfect! Thanks so much…have a wonderful weekend! White tiles really make a big difference. We bought a similar design for our bathroom reno project. What a beautiful bathroom makeover. I just love the faucet, it’s gorgeous! I’m so glad that you shared this, it looks so elegant and fancy! Thank you so much Brandy! 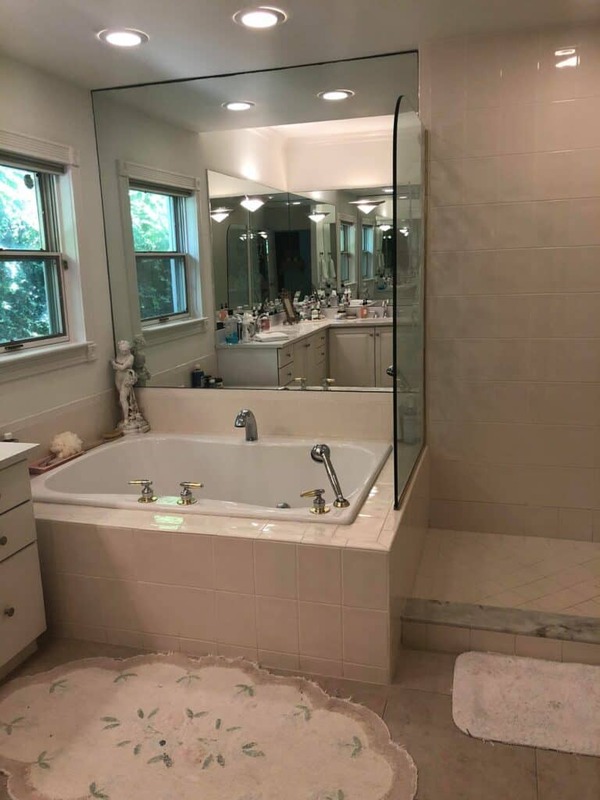 LOVE your bathroom renovation!! I wish I had a tub like that!! It’s gorgeous!! It’s gorgeous Janet. 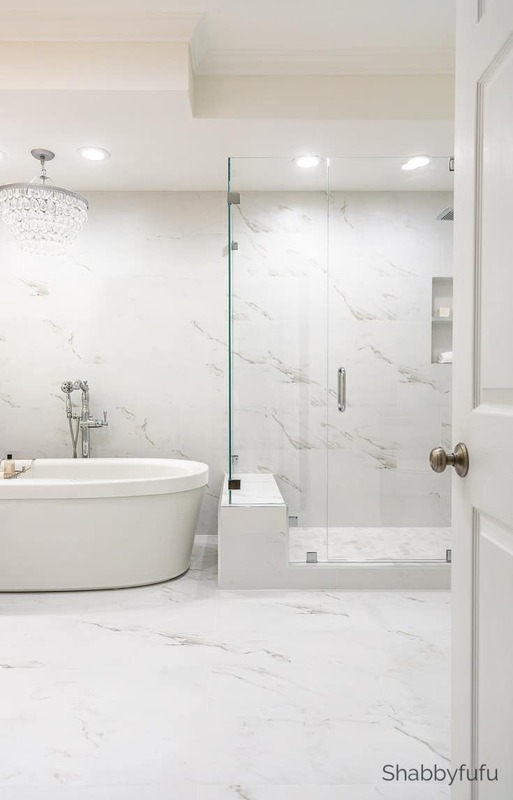 You did an amazing job, I like the free standing tub and the full wall of stone. Just lovely! Thank you Denise! That room really has been screaming for an update for sometime now and I couldn’t be happier! Wow! Such a lovely space! I love everything you have in there. The faucets are beautiful. Thanks so much…we love it! Janet this would be my dream bathroom! I love all the details you incorporated especially the faucets. Pinning for inspiration! Thank you so much Michelle…it really needed the updates! So Beautiful!!!! Janet, can you, please, share the source of this beautiful chandelier! Such loveliness, Janet! Just sigh-worthy! Thanks for sharing on Homestyle Gathering! Hugs! Hi Janet! Your bathroom makeover is beautiful! What a transformation! I wanted to let you know that you are one of my features for our first party at Homestyle Gathering. Thank you for joining us. We hope you’ll join us again this week. Thank you Kim and I thank you for the feature. Good luck with your link party! Janet, I cannot see even one thing I would change if I could have a new bathroom! Yours is absolute perfection! That tub with the chandelier above is to die for! I am so happy for you. Thank you so much Odessa and I appreciate you following me over on the blog! Interesting new project coming tomorrow to talk about.